Volkswagen Polo 1.2 TSI. Perfect dynamics of this car makes you wonder and get under its charm. The car perfectly fulfils functional duties, consuming low fuel quantity 5.3 l per 100 km and is excellent for using in city conditions. 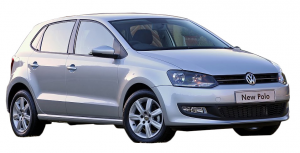 Also, the car has a sound design and comes in a medium size, but looses a bit power in comparison to the nearest kinsman Volkswagen Polo 1.4 with an automatic transmission.